When the Governor releases his budget this week, he will kick off the Fiscal Year (FY) 2020 budget debate. The FY 2020 budget will not only determine funding for schools, roads, parks, and other essential services, but can also move the discussion on how to raise the revenues our state needs to pay for these services. For those following the debate, the Massachusetts Budget and Policy Center (MassBudget) offers a new report, Five Things to Look for in the FY 2020 Budget. "State lawmakers have a tough task this year. We have many needs - such as education funding reform and transportation improvements - but we have no significant, new revenue sources to help pay for these essentials and fix substantial holes that may develop in state revenue sources over the next couple of years," said Marie-Frances Rivera, Interim President of MassBudget. 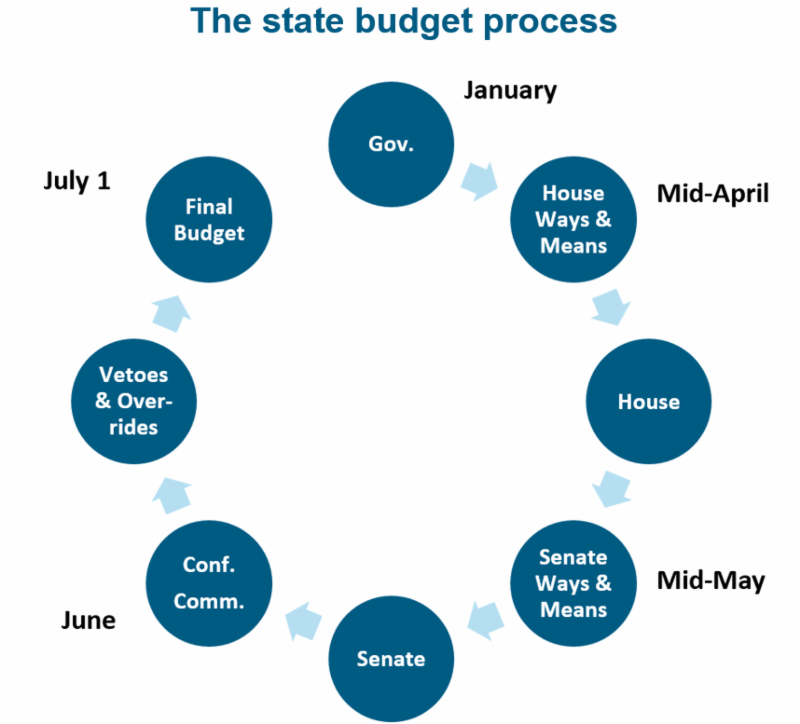 "One overarching question to consider during this year's budget cycle is whether state lawmakers propose new, progressive sources of revenue through the state budget or through independent legislation." An update of the outdated formula that funds our K-12 schools has been a key issue in recent months. Reform of this can come through the state budget or through separate legislation. Another question to consider is whether the state budget will account for this year's minimum wage increase (from $11 to $12 per hour) which will benefit many low-income workers who provide care for children, the elderly, and people with disabilities. Without funding from the state, providers may struggle to maintain the same level and quality of services while paying their workers the higher wage. Undergirding the questions on spending is a question on how the state can generate adequate revenues to overcome impending shortfalls and plan for the future. The revenue forecast over FY 2019 and FY 2020 is mixed and will depend greatly on whether the state economy's decade-long upturn will slow or falter. Further, over the next two years, the state expects to see substantial holes develop in both tax and non-tax revenue sources - stemming from scheduled drops in the personal income tax rate and from the expiration of a roughly $260 million temporary assessment to help pay for subsidized health care. Neither the Governor nor the Legislature has yet offered specific plans that would fill those holes with new revenues. It will be worth considering whether any proposed taxes or fees make the state's tax system more equitable - by requiring top income-earners to contribute a greater share of their incomes, closer to the share that everyone else pays. The report also includes information to help budget watchers follow the debates. Readers can track funding recommendations in each budget proposal using MassBudget's Budget Browser.